Do You Want a Free Ab Workout Routine? Have you ever wondered how to get six pack abs? This free ab workout routine will have you turning heads in no time. In order to get a set of ripped abs, you need to work the abs specifically with a quality workout such as the Middle Management® Best Ab Workout. While the workout is important, to be able to see the fruits of your labor and show off your hard earned six pack abs, you need to lower your body fat to less than 10% if you are a male, and less than 14% if you are a female. This article on how to get six pack abs concentrates on a two-prong free ab workout routine; however, nutrition is also a vital part of a complete approach to six pack abs. The ab workout routine is split into two parts to show you how to get six pack abs. The fist part of the overall ab routine is the ab workout, designed to build your ab muscles, and a free cardio workout routine, designed to burn fat to show off your hard work. 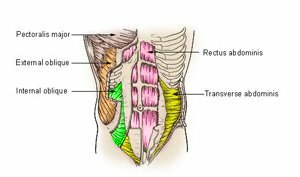 Part 1 of this article on how to get six pack abs is an ab workout routine designed to work all parts of your abdominal muscle anatomy. The picture at right shows all of the targeted areas of the abs in this free ab workout routine. This ab workout routine is an advanced workout. It consists of 12 sets to target all four of the major muscle groups above. As mentioned, and exercise ball is used extensively. However, not having an exercise ball should not preclude your from attmepting this workout. Simply lie on the floor or exercise bench. Perform this workout 1 to 2 times per week, allowing adequate rest (at least 48 hours) between sessions. *Note: Hold the vacuum for a 10 count on each repitition. Part 2 of the article on how to get six pack abs is an advanced cardio/aerobic routine designed to burn fat fast. It shows how to get six pack abs through cardio/aerobic exercise. This part of the free ab workout routine is an interval workout. Interval workout routines help you burn fat efficiently. If you want to know how to get six pack abs, then you must burn fat through high intensity cardio/aerobic work. Many people think that crunches and sit-ups are how to get six pack abs. They would only be partially correct. You can hundreds of crunches and sit-ups each and every day; however, if you abs continue to be covered by a layer of fat, you will never be able to see the results of all of that hard work. A good cardio workout routine to burn fat, such as this one included in the free ab workout routine, should consist of three distinct section. The first section of part 2 of the ab workout routine is a short warm up period of approximately 5 minutes to prepare the muscle for the higher intensity workout period. Follow the warm-up period by 20 to 40 minutes of high intensity cardio work to burn fat. In order to maximize fat burning, you should use interval training in this section. Interval training is just what it sounds like. It is intervals of 1 to 3 minutes of high intensity exercise followed by 1 to 3 minute intervals of recovery. Complete the cardio/aerobic session with another 5-minute session to cool down. This will allow you to return your heart rate to levels that are more normal. If you have ever gotten off a piece of cardio equipment and felt dizzy, this may be from an insufficient cool down period. Cooling down after high intensity exercises helps bring down your heart rate progressively. For this advanced workout to burn fat, we are going to rely on the perceive exertion (PE) scale. Our article on perceived exertion provides more information. Perceived exertion is an easy way to measure the intensity of your exercise when you don't have a heart rate monitor handy. The adjusted scale that we use here at Middle Management® is a 1 through 10 scale, with one representing no activity and 10 representing an all out effort. Warm up and cool down usually occur in the 5 to 6 range on the PE scale. For this part of the free ab workout routine, you may choose your favorite cardio equipment. You should perform this cardio routine 2 to 3 days per week for optimal results. Check out this awesome beginner ab workout, visit our friends over at Free Ab Workout.